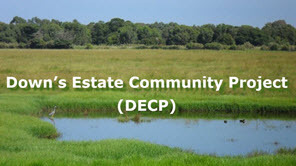 Attached is the Down’s Estate Community Project DECP Annual Report: September 2016 to March 2018, which was tabled at the AGM on 1 March 2018. Andrew and Brian signing-in, closely monitored by Pat. At the Down’s Estate, 190 Old Wells Rd Seaford, (opposite the Frankston City Motorbike Park - https://goo.gl/maps/iNArdaKAyis). You are welcome to come early to join the regular Saturday working bee (see below) and stay after for the picnic lunch and BBQ. Dogs are also welcome, but must be kept on leads. Note that the site now has a “very clean portable loo”. Down’s Estate is an alcohol free space.